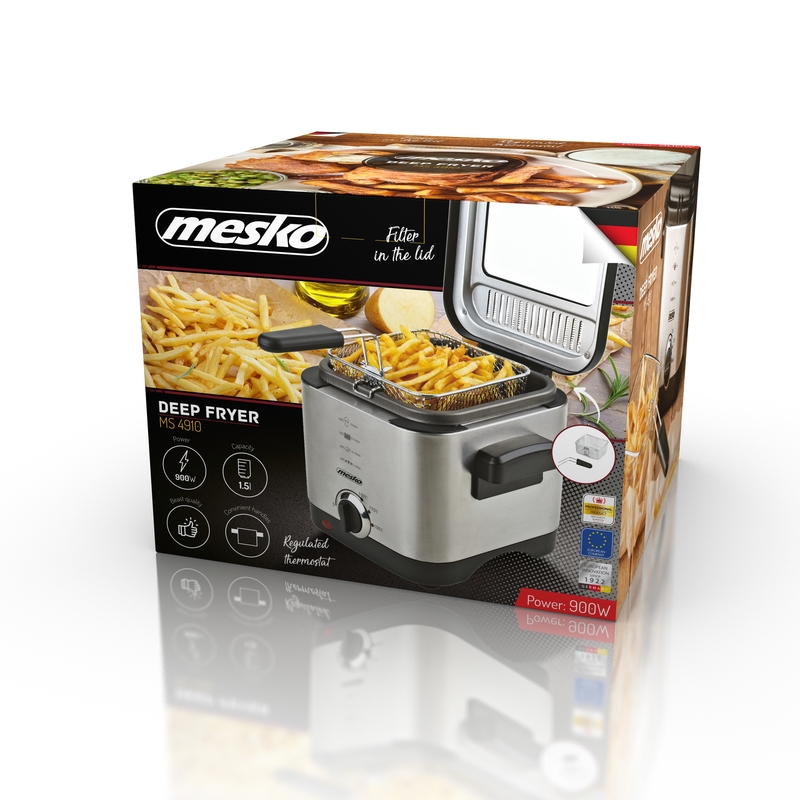 When you are throwing a big party or planning a dinner for a bigger number of people you can include serving home-made frites, onion rings, chicken nuggets or coated vegetables. The MS 4910 deep fryer that has a capacity of 1.5l is perfect when preparing such deep-fried meals or additives for a number of people. 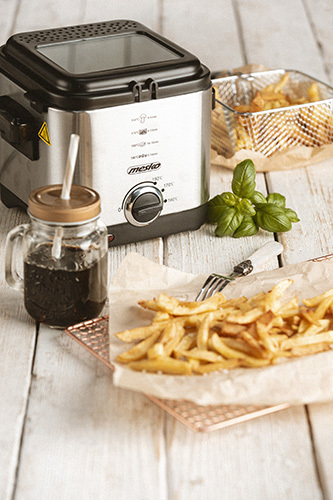 Thanks to MS 4910 deep fryer you can fry your frites, onion rings, vegetables or meat easily at home: the device is equipped with a filter in the lid and a lid opening button. You will not burn the food thanks to the regulated thermostat. You can drip the surplus of fat thanks to the basked with lifting function that has a folding handle. 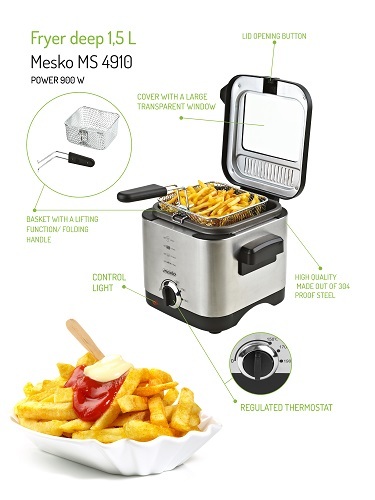 The high-quality deep fryer Mesko MS 4910 is a device thanks to which in a few moments you will prepare your favourite fries, wings, onion rings and doughnuts. Interesting design and simplicity of use are its greatest advantages! It is safe to say that each of us likes this type of snack and thanks to our product, the whole family will be able to enjoy them! Fried snacks are the weakness of many foodies. 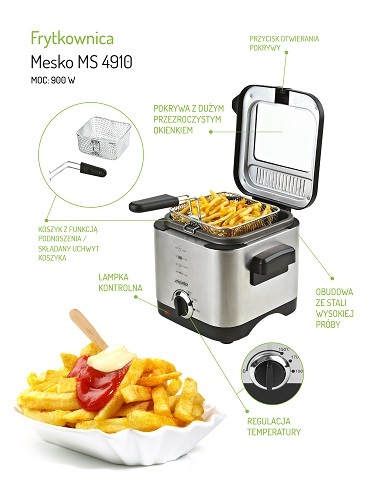 There is nothing better than crispy potatoes, fries from sweet potatoes or spicy wings, which will make meetings with friends, watching the movie in the evening or match of your favourite team even more enjoyable. 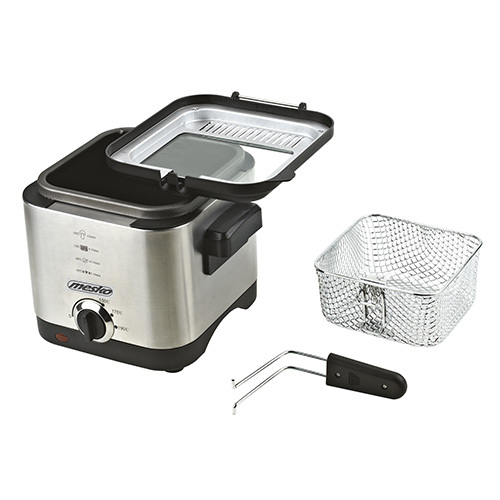 People with a sweet tooth will soon appreciate the convenience of frying their favourite doughnuts or pancakes. No more using of different pots or saucepans, the size of which never fully satisfies us. 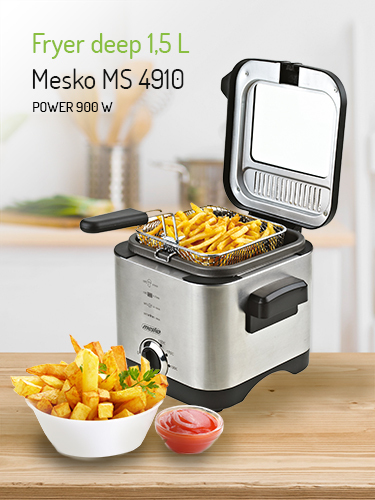 The power of our device is up to 900 W, so preparing your favourite dish takes only a few moments! 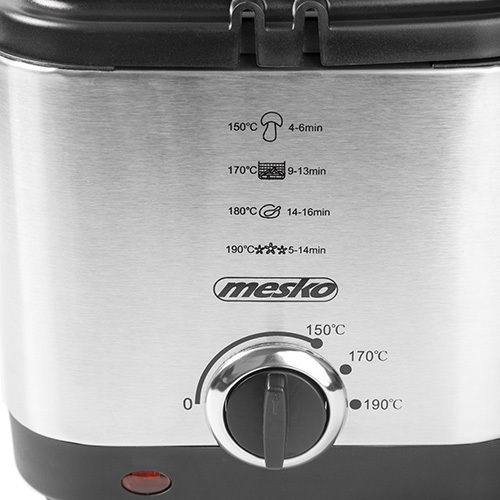 The capacity of up to 1.5 litres allows you to prepare dinner ingredients for the whole family in one frying. 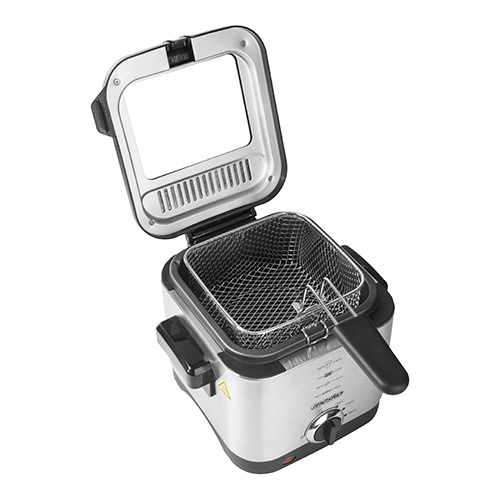 A basket with a lifting function and a non-warming handle allow you to control the degree of browning of the products and mix them during frying. 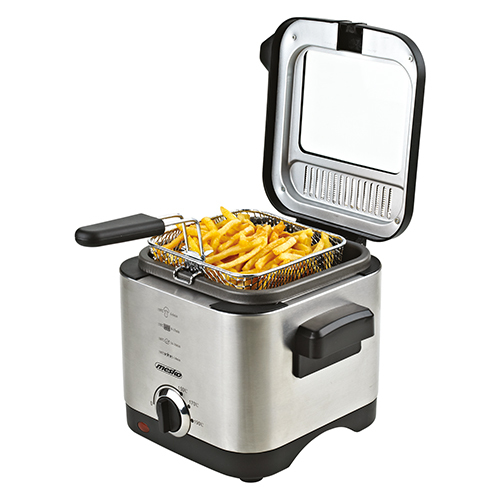 At one frying, you can get up to 500g of products. 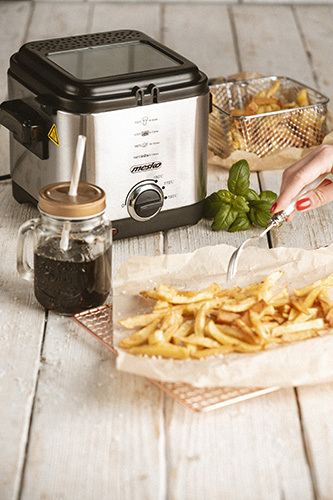 A modern deep fryer will undoubtedly help us in the kitchen. Using it is intuitive! The device is equipped with an anti-odour filter in the lid, which will eliminate unwanted aromas from the kitchen and the entire apartment. All necessary switches and knobs are located in an easily accessible place on the device. 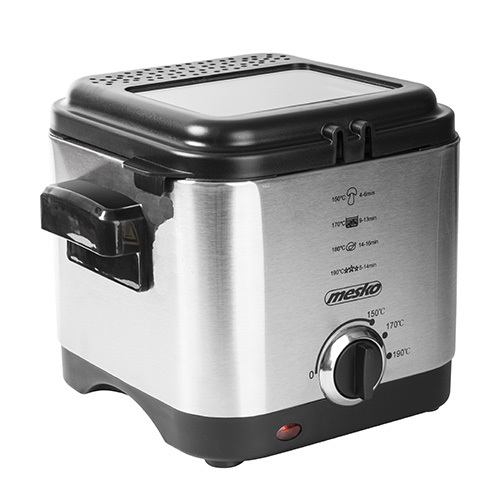 The regulated thermostat allows you to control the temperature of frying. And the set of pictograms above it is helpful in determining the time and temperature of preparing individual dishes. The control lamp (red) inform about the device's operation. 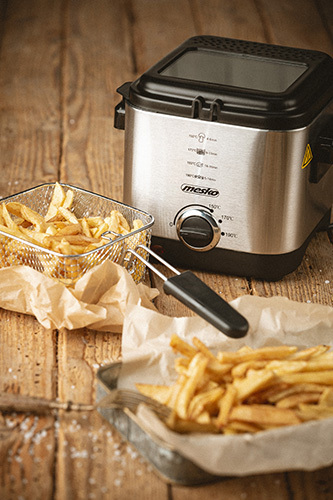 Thanks to the use of high-quality materials, the deep fryer will work in home cooking as well.